Basic tool for monitoring system uptime. Vov System Uptime runs in the system tray and allows you to see the system uptime with a single mouse click. It lets you know how long your computer has been running. Getting the system uptime, which tells you how long your computer has been on, is surprisingly difficult on Windows. Thankfully, though, you can rely on Vov System Uptime to make this task easier. 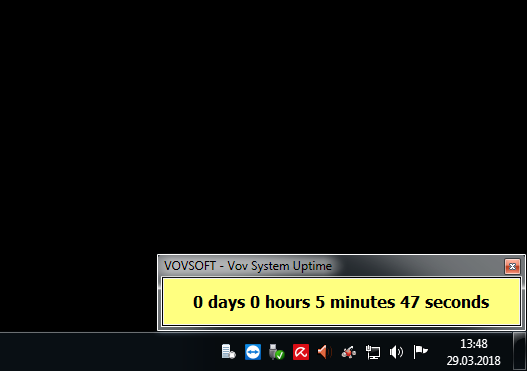 Vov System Uptime is a very small application, so you should be able to set everything up in seconds. Once installed, the application can be found in the system tray. It displays only a small form in the system tray area when you click the icon. The window can be resized and moved freely on your desktop. If you right-click the tray icon, you will see a menu that enables you to bring up the uptime form or copy the information to the clipboard.